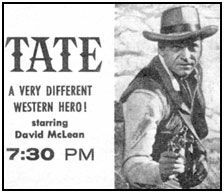 Tate was a television series that ran in 1960. The hero was a one-armed gunslinger who worked for hire (for the good guys, of course). He actually had his other arm, but had lost the use of it in the War of Yankee Aggression. That a one-armed man could draw a gun is believable, but some of the other predicaments that he might get into on the frontier are not. Does it make much sense for him to go riding alone across the frontier, when the slightest accident could render him totally helpless? Things like putting on and buttoning his jeans became a major project with one hand. And the room for error in everyday matters would be so small in those days that the reality of a man being able to follow that line of work is practically nil.